1/2 Yard - Need More than 1/2 Yard? 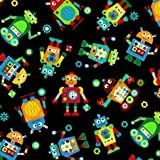 This Will Ship in ONE CONTINUOUS PIECE...BRAND NEW Store Stock...Colorful ROBOT "Gear Heads" on Black Fabric...1/2 Yard x 44 Inches Wide...100% Cotton - Machine Washable...Wonderful Print Features Adorable Robots Tossed on a Black Background...Makes Wonderful Pillows, Curtains, Bedding, Quilts, Crafts & More...Decorate Your Little One's Bedroom or Playroom!...Makes an Awesome UNIQUE Gift, too! Ideal for Making a Quilt, Throw Pillows, Blankets, Window Valances, Curtains & More!